Textile testing and research & development for manufacturers. The college also offers textile training and classes. Gelok International is a premier manufacturer of low-profile, superabsorbent laminates that are designed to absorb aqueous fluids such as blood, exudate and urine. Applications include food tray packaging, medical packaging, spill control, personal hygiene, medical cleanup, wound dressings and filtration media for water removal. 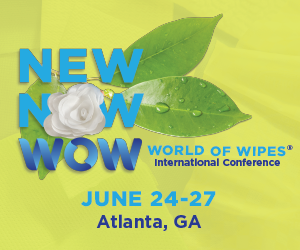 In addition to manufacturing our own extensive line of products, Georgia-Pacific also supplies other manufacturers with specially engineered, absorbent materials, called nonwovens. These include airlaid and carded fabrics. We produce antimicrobial plastic master batches, such as PP, PA, PET, PE, etc. for nonwoven fabrics. It will mak the nonwoven fabric product have permanent antibacterial function. It also helps to reduce odor. This master batch will not impact the color and can be easily mixed with nonwoven fabric raw materials. GKD-USA produces woven process conveyor belting for forming, binding, drying, curing and also for continuous filtration. Our products are used to accomplish quality results of nonwoven products processes. Synthetic, stainless steel, bronze and combinations of these materials in simple and complex weaves are applied in various temperatures, chemical and speed environments. GKD attributes of true tracking, precision and durability are known the world over. Additionally, precision woven filter media and filter elements from GKD range from single digit microns on up in widths up to 26 feet. From hot gas to liquid to polymer filtration and beyond, we have the solution. Get high performance, versatility and ultra-absorbent qualities with the worlds best made airlaid, delivered through Glatfelters Advanced Airlaid Materials business unit (formerly Concert Industries). Worldwide, Glatfelters high-quality airlaid materials are relied upon every day for a variety of needs, from hygiene and personal care products to home care, food packaging and industrial applications. As the world leader in high-quality, customized nonwoven airlaid materials, Glatfelter offers a combination of global capabilities, superior customer service and innovation to bring you a new world of solutions for a wide range of fast-growing specialized markets. Global Packaging is a 10-color flexographic printer and bag converter, offering lamination and slitting. State of the art equipment and technology. Roll goods supplier, manufacturing elastic SMMS SMS Spunbond & Thermal bond fabrics and laminates for Personal Care, Health Care, Medical, Protection, Industrials, Sports. GPF Product lines include : Elastic fastening system and elastic waistband for baby & Inco. diapers, medical grade masks, headhoods and doctor's cap. Location strips, elastic face mask sheet. Goulston Technologies specializes in changing the functionality of fiber surfaces. Long known for supplying topically applied finishes to the synthetic fiber and nonwovens industries, Goulston now has melt additives that change the surface of a polymeric material. Our hydrophobic additives are used to produce SMS fabrics for medical applications and our hydrophilic additives are used for agricultural fabrics. Goulston has also developed additives that alter the rate of crystallization of olefin, polyester and polyamide materials. These can be used to increase extrusion speed or alternatively to change the ductility of the fiber surface. Finally, Goulston has developed a non crosslinking, non yellowing polyester I.V. enhancer, useful for recycling PET waste or scrap. GP Cellulose, LLC, operates state-of-the-art pulp mills in Brunswick, Georgia, and New Augusta, Mississippi, in addition to sales offices in Switzerland, the United States, Uruguay and Hong Kong and a new sales representative office in China. Over 1.3 million tonnes of fluff, market, and filter pulps are shipped to customers around the world.|GP Cellulose pulps are used for a variety of applications. Golden Isles® fluff and filter pulps are used for absorbent applications including diapers and feminine hygiene products, baby wipes and other disposable wipes, as well as filter applications such as automotive and coffee filters and tea bags.|Southern softwood pulps, including Leaf River 90® are used for all types of paper products, including fine writing and printing papers, computer and copy paper, coffee filters, postage stamps and calendars. GPMI has been in the business of making, supplying of many products consisting of nonwovens, including wet wipes and dry wipes using many technologies such as spunlaced, thermobond, needlepunch, etc. Graf Metallic Of America, Inc. Since 1917, Graf has been one of the world's leading manufacturers of innovative metallic card clothings for cards. Additionally, Graf provides competitive erection and mounting services and customized engineering solutions. The choice of the right clothing is of decisive importance for high productivity, quality and economic efficiency. Qualified Graf specialists competently advise and support customers in selecting their application-specific clothings and work together with them to develop a solution in line with the customer's requirements and expectations. Graf's qualified service technicians with their broad knowledge provide services, i.e. dismantling/fitting of the clothings, checking and adjusting settings for optimal performance, etc. to ensure professional product processing, reduced downtimes and optimal results for our customers. Graf has released a new product, the Hipro, a metallic card clothing particularly suitable for application on high production roller cards. Graf Metallic of America, located Spartanburg, South Carolina, provides carding wire, accessories, field and shop services for the entire USA. Consultant for nonwoven products including sourcing raw materials and finished products. In the felting and nonwoven industry our products are used for the manufacture of carpets, geotextiles, technical textiles, filling agents, insulation materials, filters and medical products. Since 1980, the brand name Groz-Beckert has stood for top technology and reliable partnership in the field of felting and structuring needles. Later on jet strips used in the spun lace process were added to the product portfolio. These precision quality products are known for their exact production tolerances. Only absolute uniformity of the felting needles makes possible complex production processes for innovative, high-standard and intelligent technical products (non-wovens). Our customers manufacture, among other things, needle felts for the automotive and aircraft industry and felts for use in paper machines. |Our felting needle product area has been certified in accordance with DIN EN ISO 9001 since August 1995 as an independent production sector within Groz-Beckert KG.